Achieve keyword success in your SEO campaign with the promising functionalities of RYTE and conquer and monitor top positions in Google. Reveal the most important keywords, examine your search engine performance and discover new ranking opportunities. Sounds promising, right? Check the experiences we’ve gained with the rank tracking section of RYTE in this review! RYTE is an all-round SEO tool where website success, content success and search success are key. Can RYTE compete with the more specialized rank tracking tools and really offer the promised search success? When you use RYTE, you have access to 100% real Google data in stead of scraped data. And on the base of this data, you can constantly monitor the development of your keywords. Think of detailed information like impressions, clicks, and click through rate (CTR). Another benefit of using RYTE: whilst Google Search Console saves your data for a limited time only, RYTE keeps your data available for an unlimited period of time. Another important functionality of RYTE: checking whether you’re not accidentally committing keyword cannibalism. Lots of websites unknowingly have multiple pages that rank on the same keyword. And this you want to avoid, since it has negative consequences for your rankings. Fortunately, RYTE checks if for you, so you’re sure you’ll rank with unique keywords for every page. Furthermore, you can compare traffic coming from different devices and different (international) markets. Also, you can simply compare historical data, for instance periods like months, weeks or days. You can also easily identify new ranking potential in Google to further improve your search performance. Wat do we think of RTYE when it comes to rank tracking? RYTE is a SEO tool with a wide range of functionalities that enable you to considerably improve your SEO campaign. In this text, we have zoomed in on the rank tracking aspect to see whether the application can compete with other tools that are out there. Our conclusion? Yes, although RYTE is an all-round SEO tool whereof you might not expect to be able to perform in-depth analyses, the tool is definitely a match for other more specialized rank tracking tools. 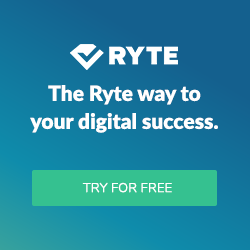 Discover the RYTE software suite for free!